AM: No morning run. Instead, major leak in our basement. Now I'm $5,000 poorer. PM: I wanted to meet Kramer at the Olympic Oval for a workout (trying to avoid the rain/snow/sleet/wind) and I planned to get in a few miles there but when we arrived we were told that the track was closed for some reason. It pays to call and check. So we went next door to the county rec center and did a treadmill workout. Kramer did ten miles with the middle five in about 28:30. You basically can't ever go wrong with a five mile tempo. I did 4 X 1 mile in 5:56, 5:56, 5:52, 5:42. I just noticed Curly, the new mileage board king. Why would a person be on two internet running log sites when all you do on one site is link to the other? 15.25 miles in 1:59 around Sugar House. Started at 3:45 am. Not ideal given that sleep is important, but the only option today. Seven miles around Orem before the track meet. Blake Bennion's 10:11 was the highlight of the meet for my boys. Ran a quarter mile on the treadmill waiting for my runners to show up, then did 10.75 miles in the gully with Aaron, Blake, Davis, and Ashton. Included some striders in the parking lot. I feel good and mostly ache-free after a 72 mile week. Long run tomorrow. Maybe up at Jeremy Ranch. PM: 3 mile walk. 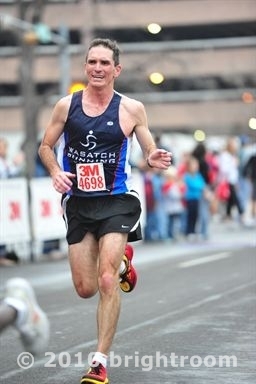 I'm really impressed with Scott Keate's 1:08 today at the ripe old age of 40. Inspired too. Ten miles in 1:16 around the neighborhood. Did six 400 meter pick-ups making this a little fartleky. Probably the most beautiful morning in 6 months and I'm stuck in my classroom. I want to quit my job and go for a trail run. I had a Diet Pepsi today. AM: 12.25 early morning miles. Not as hard this morning and not as cold. I do wish I could find someone to run with me at 3:45 though. AM:Two easy miles around the upper loop. PM: Ran an easy five around Bingham HS and then stepped into the 3200. Ran the first couple laps with the girls and then got semi serious, running a few seconds faster each lap. Eventually worked my way up to third place behind Braydon and Jacob in a respectable 11:48 after coming through the mile in 6:04. Easily won the Masters division. Cooled down a mile with Braydon who's off to Arcadia tomorrow. AM: Easy run around the neighborhood. PM: Nine mile treadmill fartlek. Included 20 minutes at 5:50 pace. The PF is acting up. Achy right foot. 15 miles in two hours around Sugarhouse. Hard to get the legs rolling before 4 am! The Canyons School District was good to me this week. I got a new MacBook Pro laptop and a new I Pad. Took a needed day off. Spent the whole day at a track meet anyway. Happy with Kramer's 4:16 and Braydon's 1:56 down at Arcadia. Blake ran a nice 4:40 1600 today as well. Good, hard working kids. Heading down to Bryce Canyon tomorrow with the family for a couple days. Hope to get in some good runs. Fifteen miles around Liberty Park in 1:55. Close to as perfect a morning for running as it gets. Ran into Fritz, James, and Allie for the last lap. Five miles around the "Fairyland" loop and Rim Trail at Bryce. The Fairyland trail is a more manly trail run than the name implies. I was going to do more but I was way over dressed and was a miserable, soaking wet mess on the more strenuous climbs. I'll go back later and get some miles in on the Rim Trail. PM: Twelve miles on the Bryce Canyon Rim Trail. Pretty empty trail except for the areas around the parking lots and view points. Ann revealed to me at dinner tonight that she had a crush on Faron Young as a child. Seriously, just google the name to get a sense of how much she rocked in the seventies. I did an encore of the Bryce Canyon Rim Trail this morning from Fairyland Point to Bryce Point and backwhich is exactly 11 miles plus a little extra in the parking lot. 1:41 with the last mile in 7:23. Slowest mile was 10:01. Definitely a bucket list run. I started around 7 am and saw maybe ten people the whole way on a perfect morning. PM: 3 mile walk with Ann. I'm a bit sore. AM: Nice, long walk with Ann. PM: Two mile walk/jog up to the Red Box and back to rent Gravity for our evening's entertainment. AM: Nine miles around Liberty Park before my sparsley attended track practice. PM: 5.25 on the treadmill while Abby was practicing. Lots of walking today too. Back and forth to the school with Andy to play wall ball and back and forth to the Maverick to get some cigarettes and beer. Fifteen miles up at Jeremy Ranch in 1:56. Really "challenging" headwind on the way back and quite a lot of traffic. Lots of dirt in the eyes and mouth. Closed with a 6:17 last mile. Not bad. The positive was the nice tailwind going out! Five miles super easy around the neighborhood and Highland High track. Managed to almost completely avoid paved roads and concrete this week. With the easy day today, I should be primed for a decent workout tomorrow if I can squeeze it in sometime. 18.25 miles plus some fast striders at Liberty Park. As usual on a warm Sunday, we had hippies in the drum circle, lots of tension between Polynesians and Mexicans with their dueling car stereos and pit bulls that was keeping the cops on mountain bikes busy. Fights over scarce parking spaces. That and the homeless overflow from Pioneer Park and you have lots to watch and keep your mind occupied. I'm starting to feel pretty fit. Actually, I'm feeling faster and stronger than I have in years. Too bad I don't have a weekend until June where I can fit a race in. Probably good in the long run though. Rest day. Top running experts reccomend these from time to time. Today I did my treadmill fartlek for 60 minutes after warming up. Spent 24 minutes at six minute pace down to 5:40 pace in four minute chunks. This workout used to be hard. These days I'm finishing it with plenty left in the tank. Hectic 24 hours. Mom came to visit from Florida and we had to admit her to the hospital on Tuesday. She's going to be ok though. Squeezed in an easy 8 with some striders and core stuff. Andy had his first baseball game this afternoon. 2 for 2 with 2 triples at the plate and made a nice put out at 1st base. He's excited. I fear for his running potential though. Walking to the car he said he'd rather hit singles because running from home to third base without stopping is really tiring. AM: Two easy miles around the school. PM: Moderately hard run.9.42 miles in 60 minutes plus warm-up and cool-down. I'll call this marathon pace to fast marathon pace. Or that's what I'd call it if I ran marathons. PPM: One mile walk with Ann. I'm dragging! Two workouts in three days is too many in my old age. One every three or four days is plenty. Or once a week. 255 floors on the stairmaster in 30 minutes followed by 2 eliptickle miles in 14:50. Then some push-ups, sit-ups, core stuff. Five easy by myself around Liberty Park before meeting up with Fritz, Allie, Collin, and Adam for a tour of the East side of Salt Lake and then back to Liberty and a couple more laps around with Fritz. 16 miles in 1:59. Today is the eighth anniversary of the day we adopted Andy. Dinner, as always, at Bucca di Beppo downdown! I'm glad I earned those carbs. I'm feeling in a funk about my job today. Ever have one of those days where you feel like your work isn't important but other things are and your work keeps you from those other things? Hope to get in some easy miles and hot tubbing later today. PM: Sure enough, 5.25 easy treadmill miles plus a hot tub soak. 10.25 miles on the treadmill with 2 X 2 miles with a quarter mile jog interval. Ran 11:58 and 11:30. AM: Two mile jog around Sandy, Utah. Just had my mid-morning banana - Delightful.